After sending G off to Brooklyn, I drove out to the land. I wandered a bit and then put out a comfy chair and read until the quiet and the heat conspired to make me fall asleep. I woke up a while later, washed up and started out to go home. There was something in the driveway so I stopped to take a look. It was a rat relaxing in the cool shade where the puddles usually form. The mulberry tree has been dropping some late mulberries there and the rat was alternating between dozing and munching. Unlike the rat at my rent house a couple of weeks ago, this guy seemed happy and healthy. Although it might be deaf, it seemed oblivious to the truck. After a while the rat puttered off into the field. As it walked under the grapevines, I noticed something move, so I got out of the truck to take a look. 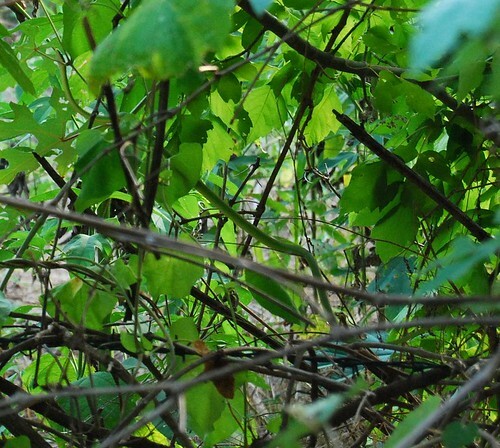 There was a long skinny green snake up in the vines. Oh great. Now I have to get a snake hat too. And you need a bunny hat. Also, I know they are part of nature, but rats are nasty. G and I saw three today, but they were running around the subway tracks like they are supposed to be. City rats are nasty. I shudder to think of where they sleep and what they eat and drink. 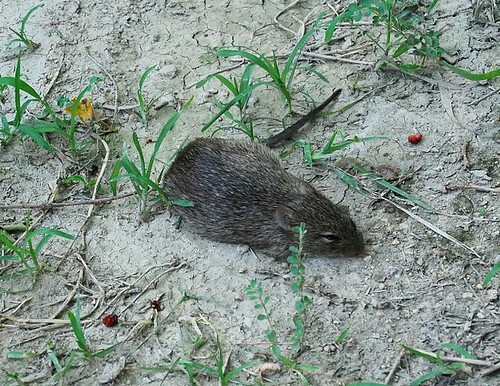 This is a field rat. It's living a healthy life in the country relaxing in the cool shade, eating mulberries, and grass seed and drinking rainwater. That's not gross. The rabbits here at the lake don't seem to mind if we watch either.